Motor vehicle dealers and finance companies often add insurance or warranties onto loans. Common examples are motor vehicle ‘warranties’ or consumer credit insurance* and gap insurance** that are added onto loans with the rest of the paperwork. Often you pay premiums for cover you don’t really understand. Worse still, you might be sold the cover without even knowing you’ve bought it. In many of these situations, you’ve been paying premiums for cover which is essentially useless to you. Insurance can be added to loans or credit cards, often to car loans. You can check your loan documents, credit card statements or purchase receipts, or you can ask the motor vehicle dealer, loan provider or bank you dealt with. These products cost hundreds or thousands of dollars so it is worth taking a look. Remember also that if the premium has been added to a loan, you will also be paying interest on this amount as well. If you have a pre-existing condition. Check the wording of your policy to see if it covers what you need. Sometimes policies do not provide the cover a consumer expects. For example, some motor vehicle warranties, known as ‘discretionary risk products’, give the provider an absolute discretion about whether or not they will pay claims. 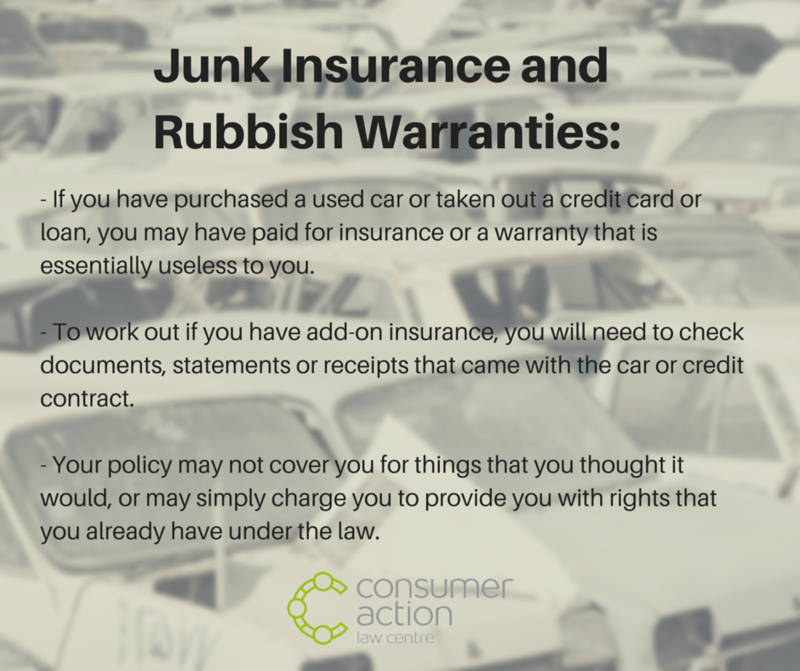 This means that you may not be paid, even if your claim falls within the terms and conditions of the warranty. Sometimes warranties give less protection than a consumer already has under the consumer guarantee provisions of the Australian Consumer Law. If you are unhappy with the response from the insurer, warranty company or credit provider, you can complain to the Financial Ombudsman Service, which provides free, independent dispute resolution. Telephone: (03) 9629 6300, or 1800 466 477 for country and mobile phone callers. You can also use our online form to send us an email. This fact sheet is for information purposes only and should not be relied upon as legal advice. This information applies only in Victoria and was updated on December 31 2015. *Consumer credit insurance is designed to protect a consumer’s ability to meet their credit repayments in the event of death and/or involuntary unemployment and/or permanent disablement. The benefits are generally paid directly to the finance provider. **GAP insurance generally provides cover if a motor vehicle is written off. It is designed to cover the difference between what your insurer pays out and what you owe on the loan.